Light and Learning. Studies show that adding light to school spaces improves learning. Innovations such as fire rated glass walls and site planning increase the amount of natural light in schools. Recent studies confirm that when school spaces are brighter, students learn faster, teacher morale improves, and districts can dramatically cut energy costs. As a result, school districts and their architects are working hard to find new ways to maximize the amount of light reaching into windowless spaces previously designed to control temperatures and prevent student distraction. To capture, pass on and share both daylight and new, environmentally-friendly artificial lighting, glazing has become the material of choice because it allows light to filter from one space to the next. Glazing has the added benefit of providing clear vision between spaces offering a sense of openness, connectivity and security. 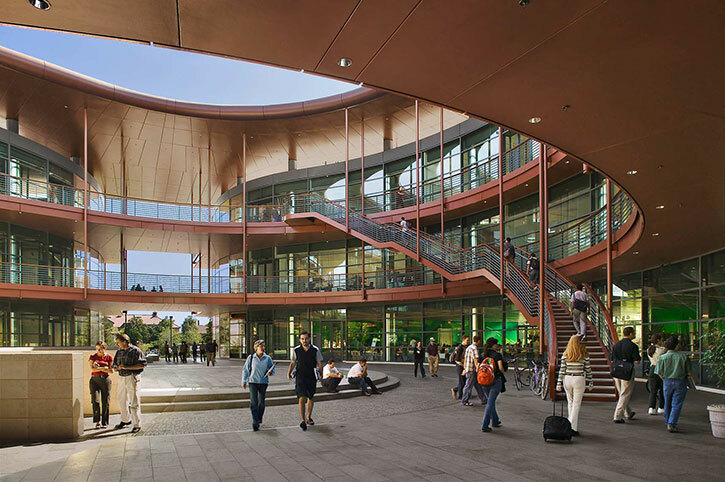 Innovative designers have taken advantage of advances in glazing products to create 21st century schools that look quite different than the schools baby boomers attended. These schools also perform better in student achievement and energy savings. Here are some innovative solutions that bring in light to learning spaces and reduce energy usage. Site Planning. Since an exterior surface can receive as much as 10,000 foot candles of light a day, or 200 times what is needed in the classroom, it is more efficient to control the amount of sunlight entering the building from the outside than to control the solar heat gain once it is inside. The Collaborative for High Performance Schools offers a Best Practices Manual that says that southern orientations offer the best daylighting opportunities and that east and west orientations present challenges with glare and solar gain. Energy-Efficient Glazing. Windows, glazed doors, skylights and other openings can bring in more than natural light into a building; without proper planning, added light can also bring in heat. Architectural features like light shelves, interior shading devices and interior reflective surfaces work to reduce solar heat gain. 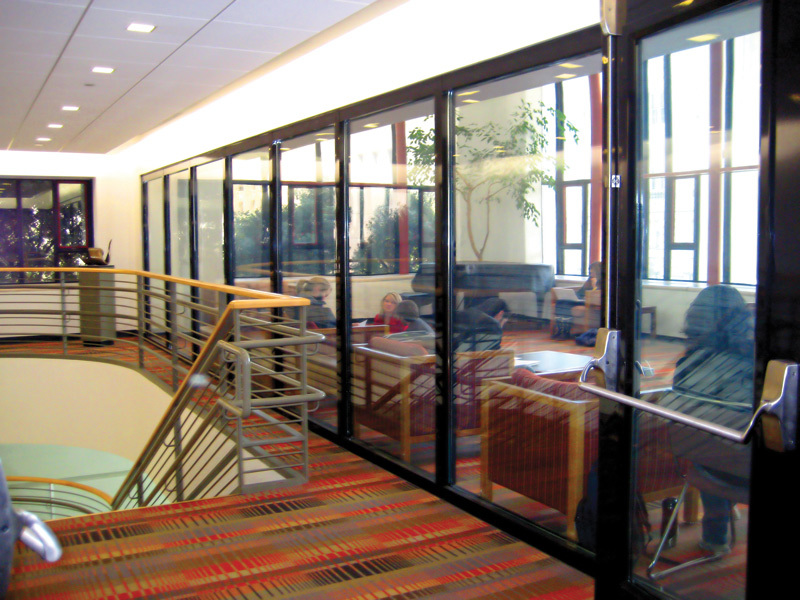 To address this potential problem, glass manufacturers have introduced products that maximize vision and lighting benefits of glass and limit the heat entering a school facility. Today, there is a myriad of energy-efficient glazing choices available to designers, including tinted glass, reflective glass, low-e coatings, and insulated glass. On the horizon is photovoltaic glazing, which not only provides views and lighting, but enables the glass to capture sunlight and convert it to electricity to help power the building. Transparent Walls. One of the biggest challenges is getting natural light into interior spaces without windows to the outside world. Thanks to advances in fire-rated technology, fire and impact resistant glazing can now be used extensively in lightwells, stairwells, corridors, wall partitions, lobbies, interior courtyards and other places where masonry, gypsum or other conventional fire-resistant wall materials were once the only choices. These transparent fire-protection barriers allow light to pass from one area to another, blending natural and artificial lighting into spaces deep inside a building. We are seeing greater use of interior glazing as a school design strategy to expand the use of daylight and minimize the use of artificial lighting, says Jeff Griffiths, Director of Business Development at SaftiFirst, a leading fire-rated glass manufacturer. By placing fire-rated glazing in corridors, enclosed stairways, interior courtyards and various types of interior spaces, schools save energy, create a sense of openness and enhance personal safety. Buildings use about 70% of Americas electricity every year. Design that reduces energy usage not only saves money, but also reduces carbon emissions that contribute to climate change. Over half of the electricity used annually in educational buildings goes to light and cool facilities.These two uses are related due to the amount of heat generated by traditional artificial lighting. reduce connected lighting power density by increasing natural or shared light. reduce energy consumption with daylight controls for 50% of the lighting load. design a site, choose building materials, use architectural features and employ reflective materials to reduce lighting and cooling loads. offer operable windows and other sustainable solutions for thermal comfort. Boiled down, many LEED strategies work to increase energy efficiency by adding daylight and by sharing low-energy, electric lighting. Applying appropriate glazing in walls, roofs, corridors and stairwells goes a long way toward building green. As pressure mounts to design and construct better performing buildings, innovative glass manufacturers will continue to provide products that not only answer the call, but exceed expectations. LEED 2009 for Commercial Interiors Rating System, USGBC Member Approved November, 2008.